Playing in the water: Even on cold Fall and Winter days, people are still drawn to play in the water to experience the soulful call of the hydraulophone, a sound sculpture and musical instrument that you play by putting your fingers on water jets. Hydraulophones used as landscape architecture give aquatic play a sophisticated and spiritually uplifting artistic element that draws people of all ages, not just children, to play in the water. are spaces that cross or challenge the traditional boundaries that have existed between professional civic life and the more playful elements of recreational life. The urbeach mixes the formal majestic tone of urban life with the informal playful tone of beach life. Dundas Square (at Yonge and Dundas); and TELUSCAPE (the landscape architecture out in front of Ontario Science Centre). A third one is also in the works: The Rosenberg/Cormier design known as HTO, the "Urban Beach" garden on the waterfront, at Queens Quay W. and the foot of John St.. It is a wonderfully telling sign, that two of Toronto's architectural landmarks, Dundas Square, and the Ontario Science Centre, each feature an aquatic play facility as their main centerpiece. Planners decided to make the corner of Yonge and Dundas the city's symbolic core. the equivalent of running through sixty firehoses. The entire facility is supplied with three eight-inch water pipes, making it one of Toronto's most "FROLICious" experiences. It is this placement of fun and frolic at the epicenter of civic culture that defines what I mean by "urban beach". Similarly, the Ontario Science Centre was looking for something "magestic" with which to replace the big but aging fountain out in front of their building. it is a visual art sculpture, a sound sculpture, and a musical instrument, thus bringing art, music, culture, and play into the mix. around on a sound sculpture even if you are not musical), and "play" as in what you would do in a playground or aquatic play area. Children will play in almost any fountain, but adults, no matter how hot the weather, will often feel that it is too childish to run through a fountain. Making an aquatic play experience sophisticated enough to attract people of all ages is a challenge successfully addressed by the hydraulophone. Additionally, the hydraulophone creates a sense of awe and wonder that takes aquatic play to a spiritual and cerebral level, so that it is no longer necessary to drench the whole body with water to have a fun and thrilling experience. A small amount of water on the fingertips proves sufficient to provide an overwhelming sense of tactile pleasure. This makes it possible to play in the water year-round (just take off your gloves and let your fingers do the playing in the winter), or to bring aquatic play into indoor spaces like lobbies in hotels and public buildings, as well as to civic spaces that lack nearby changeroom facilities. Moreover, a wonderful aquatic play experience can be created by using only a small amount of water. In terms of "funits" (units of fun) per gallon, a hydraulophone will beat just about any other fountain hands down. You can get a huge amount of fun out of just a small amount of water. regardless of whether or not anyone is playing in it (the random gurgling of the water through the instrument also makes a soothing sound). The result is an urban beach space that is highly educational (music lessons that are fun!) and appeals to children as well as adults alike. Even seniour citizens have responded well to the hydraulophone because of the therepeutic effect of having water streams flow over their fingers. 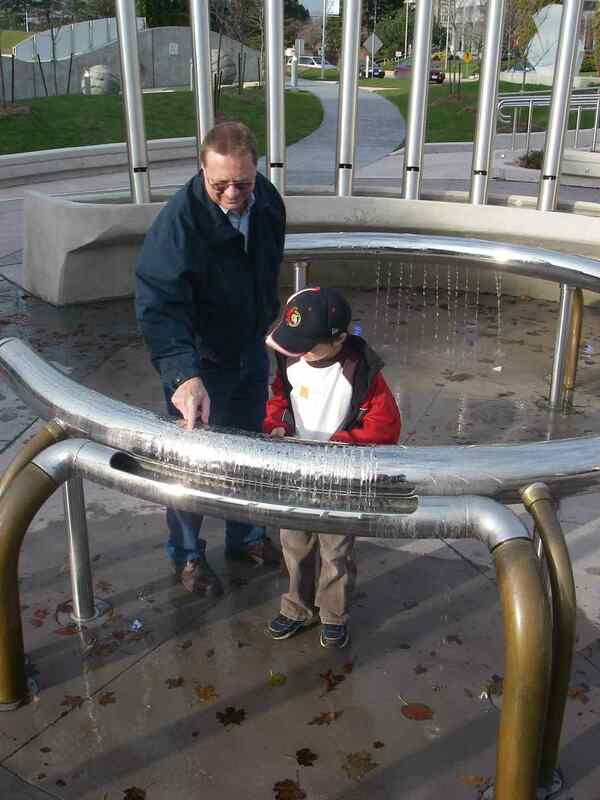 Hydraulophones have also received high ratings from the visually impaired, who connect with the tactile and sonorous elements of hydraulophone-based public art. Hydraulophones are generally mounted with sufficient clearance that a wheelchair can fit underneath, thus being accessible to the mobility impaired. Some include a catch trough so that users can play in the water without getting more than their fingers too wet. This makes the urban beach experience inclusive to all. You can see and hear early research prototpye hydraulophones as well as completed installations in: http://youtube.com/watch?v=WwUibDEH0nY. Next entry: New Green Architecture: A Model For Toronto?